Less than four hours after Shane Michael Haley was born, the newborn boy passed away. Jenna Gassew and Dan Haley welcomed their son early Thursday morning, celebrating the birth of a Pennsylvania newborn whose diagnosis in the womb with a rare, terminal condition generated support and prayers from legions of online followers. "Baby Shane is here!!" 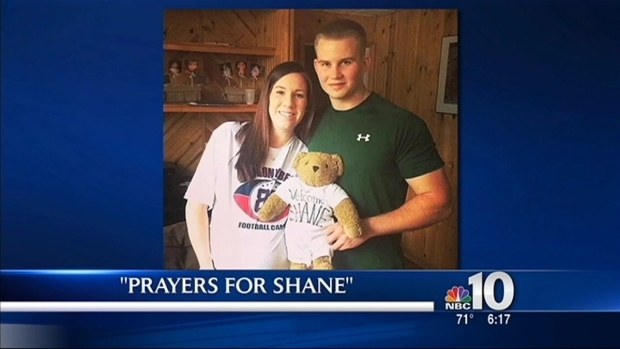 read a post on the Delaware County parents' Facebook page, Prayers for Shane, where they shared status updates of their unborn son's travels, which they called his bucket list. Half a million people are following their #shanesbucketlist updates. The newborn has anencephaly, a rare birth defect that results in babies being born without parts of their brain and skull. Most anencephalic babies live only a few hours after they are born. Shane, sadly, was no exception. "Today at 6:15 a.m., after meeting his entire family and being baptized into the Catholic faith, baby Shane died peacefully in his mother's arms," a Facebook post read. "We are so grateful for the time that we were blessed to hold and hug our son." "Shane spent his entire life in the arms of people that loved him unconditionally and I don't think you could ask for a more beautiful life [than] that... he is home now with the Lord and will forever be out little miracle," the post continued. The update was posted to the Prayers for Shane Facebook page around 10:30 a.m. -- a little more than eight hours after the baby's birth. "Shane Michael Haley...born at 2:25 a.m.... happy birthday to our little man!," a post read. "Mom and Baby are doing well!" Gassew and Haley celebrated Shane's impending arrival by posting party pictures of his extended family just days before his birth. A Delaware County couple welcomed their son, Shane Michael Haley, early Thursday morning. The child has a rare, terminal condition and is not expected to live more than just a few hours. At 6:20 p.m. Wednesday, a post appeared on the page: "Shane is on his way!" Gassew was induced at Riddle Memorial Hospital Wednesday — four days prior to her Oct. 12 due date — because there was a presence of high levels of amniotic fluid. The rare complication, called polyhydramnios, is known to come with Shane’s more serious anencephaly diagnosis. "We are so grateful for the many amazing messages, personal stories and posts we receive daily and we really appreciate all of your support! .. we are relaxing and taking the time to read him his books, talk to him, and celebrate every little moment we can .. he will be here in less than a week and we couldn't be more excited to hold little Shane in our arms!" the couple posted on Facebook after sharing the news of the planned labor. Boy Who Died From EVD-68 Was "Full of Unconditional Love"
Anencephany develops through a combination of genetics and environmental factors, according to Dr. Simon Gregory, an associate professor of medicine at the Duke Institute of Molecular Physiology, which has done research on neural tube defects like anencephaly. There is no known cure for anencephaly, because the disorder can’t be pinpointed to just one gene. The birth defects happen during the first month of pregnancy, according to the Center for Disease Control and Prevention. Gassew and Haley, who found out they were expecting in February, learned of the diagnosis in April. They took the heartbreaking news to Facebook and set up the prayer page using the social networking site. A Delaware County couple await the arrival of their first baby named Shane. His journey in the womb has been documented on Facebook and has half a million followers. Inspired by thoughts about about all the places they enjoyed going when they were kids that Shane would never get to experience, they created a bucket list for their unborn child and embarked on a summer’s worth of beach days, baseball games and concert trips. They took pictures along the way, documenting Shane’s travels using the hashtag #shanesbucketlist. Seeing the Flyers, Phillies, Zac Brown Band, New York City, Lancaster, The Franklin Institute and Linvilla Orchards were just a few of the items they got to check off their list. They made a special trip to Geno's Steaks, where they got to eat at the restaurant's only inside table with owner Geno Vento. Support poured in for the young couple on the Facebook page as family, friends and total strangers posted encouraging words daily. One maternity photographer offered her services for free and took pictures of the expectant couple at a local park, and some supporters have crocheted hats and onesies specially altered by Jenna’s grandmother to fit the baby. "It's the hardest thing in the world but you can make it through," Jenna said earlier in the pregnancy, as they set out on their bucket list. "We're his parents and we're going to take care of him as long as we can."